The programme is one of the biggest 13 programmes in the Kingdom Vision 2030 and it consolidates the sectors of industry, mining, energy and logistics, said a Saudi Press Agency report. Launched by His Royal Highness Prince Mohammed bin Salman bin Abdulaziz Al Saud, Crown Prince, Vice President of the Council of Ministers and Minister of Defense, the programme seeks to develop qualitative industries, increase non-oil exports, reduce imports, raise the contribution of the target sectors to the kingdom’s gross domestic product (GDP) and attract foreign investments. 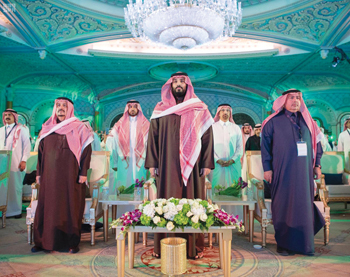 To kickstart the 12-year programme, the kingdom announced the signing of 37 agreements worth $55 billion with foreign and local investors at a ceremony attended by Crown Prince Mohammed bin Salman. The programme is part of the kingdom’s 2030 Vision, the brainchild of Prince Mohammed, which aims to diversify its economy which has been heavily dependent on oil prices. The National Industrial Development and Logistics Programme (NIDLP) covers 42 initiatives for creating local commercial activity in key sectors that include mining, logistics, and various other industries, the kingdom’s energy minister, Khalid Al Falih said in his keynote address at a conference in Riyadh to reveal the programme. The aim is to create 1.6 million new jobs, boost non-oil exports by $267 billion a year and add as much as $320 billion to gross domestic product (GDP), almost 40 per cent of last year’s GDP, he said. In a statement to SPA, Al-Falih said: “We have worked over the past period to develop plans, prepare initiatives, attract investors, and transfer initiatives and ideas into sustainable development projects. We prepared and launched incentives and potentials to support and encourage the private sector which is a strategic development partner in this programme. The programme “is one of the most important … for achieving Vision 2030, as it moves the kingdom into a new era of sustainable development, prosperity and economic diversification. 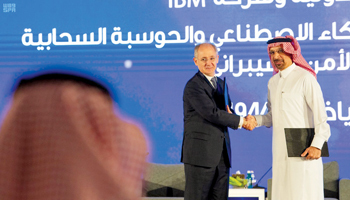 The mining sector will become a third pillar of the Saudi economy alongside oil and petrochemicals, while we continue to develop renewable energy and explore the diverse opportunities presented by the fourth industrial revolution through research and innovation,” Al Falih added. During the event, 37 agreements worth $53 billion were signed and 29 other agreements worth $960 million were announced. These are in addition to more than 25 agreements that were signed during the Future Investment Initiative 2018, with a total value of around $210 billion, of which $165 billion are under the NIDLP programme. By 2030, the programme aims to boost the contribution of these four sectors to $320 billion and increase the volume of non-oil exports to over $260 billion, according to a statement from Saudi Arabia’s Council of Economic Development Affairs. “Those who bet on the kingdom never lose,” Al Falih noted. Deals signed included a pact between Saudi Aramco, the world’s biggest oil producing company, and Saudi Basic Industries Corporation (Sabic) to continue to the next phase of studies for an oil-to-chemicals plant in the kingdom. It also signed a deal with Dubai-base DP World, among the top five ports operator globally, to build operate and transfer a container terminal at Saudi Arabia’s Jeddah port. Two military deals were also signed with France’s Thales and international defence company CMI to manufacture armoured vehicles in the kingdom. Abed Al Saadoun, kingdom’s deputy minister of energy, industry and mineral resources, earlier told the conference that what Saudi Arabia is trying to achieve from the programme is to triple the contribution of these four sectors to the gross domestic product. “Private sector jobs will rise by two times to 3.1 million. Exports from the four sectors will grow five times from levels today,” he noted. Saudi Arabia, the biggest Arab economy, is undertaking a slew of measures to help boost the contribution of the non-oil sector to the economy under Vision 2030, the overarching road map for the kingdom’s overhaul. Under Vision 2030, the private sector’s contribution to the economy is set to increase to 65 per cent by 2030 from the current 40 per cent of gross domestic product. The kingdom will sign agreements worth SR235 billion on the side-lines of the conference that include big deals to create military industries, Energy Minister Khalid Al Falih earlier told Al Arabiya TV channel. “To the extent these are export-oriented projects, they should reduce the dependence of the economy on government spending and hence on oil revenues,” said Robin Mills, chief executive of Qamar Energy. The kingdom will provide a total of SR105 billion in an “financial enablement” package, and be the main financier for NIDLP sectors of mining, industry, logistics and energy, according to a brochure distributed at the conference. It didn’t specify the timeframe for dispensing the funding. In addition, the Saudi Industrial Development Fund will provide up to 75 per cent of the capital invested in the NIDLP projects. Of the deals offered to private investors, 29 are in the industrial sector and the rest divided among mining, logistics and energy. In the industrial sector, NIDLP expects to attract $300 billion of investments, including a SR4.4 billion adhesive plant. Among the mining projects on offer is a SR28 billion integrated steel plant. The kingdom has so far invested $40 billion in mining over recent years in partnership with the private sector, allowing the industry to contribute $17 billion to the Saudi economy. In the logistics sector, the kingdom aims to develop and operate logistics zones close to major ports with investment opportunities worth SR7 billion. Under NIDLP, the energy sector will see 60 gigawatts of capacity to come online by 2030 by executing 35 renewable projects. The projects on offer include a SR3.5 billion solar cells and modules plant and a SR2.5 billion gas turbine manufacturing plant. The authority is spending SR74 billion on rail projects, he said. It is also expanding some of its ports, including King Abdullah Port, Jeddah and Dammam by investing SR10 billion. There are five airports that are being expanded or being built with as much as SR3 billion in investment. “We have 12 logistics zones in the kingdom and we are planning to float some opportunities for the private sector,” Al Rumaih said. “We are enhancing capacity to be more efficient for the private sector to grow exports from the country,” he added.